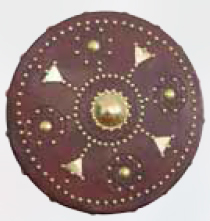 The Mini Targe is a smaller version of the Scottish Targe with a historically accurate design based on a wealth of research. This targe has patterns dating to the ‘45 Jacobite Rising. This piece is beautifully made, with tooled leather over quality wooden construction and a leather backing, nicely decorated with brass ornamentation and studs, and is equipped with a leather covered arm strap and hand grip. This targe is based on an original, which was "captured" at the BATTLE OF CULLODEN in 1746, and taken south to London with the Jacobite prisoners. It has a removeable central spike. The Targe is made of hand dyed natural leather. It is now in the Museum of the Royal Armouries in The Tower of London. This page was last modified on 28 February 2015, at 11:22.